motorsport: Laukannen to seal 2016 KNRC in Kajiado? Laukannen to seal 2016 KNRC in Kajiado? Flying Finn Tapio Laukannen is expected to seal the 2016 Kenya National Rally Championship in Kajiado Country should he pilot his Subaru Impreza GVB13 R4 machine to second overall position in the forthcoming KCB Kitengela Rally. The former Britain and Finland rally champion also hopes to lead his Multiple Racing Team (MRT) teammate Manvir Baryan to a repeat of Eldoret Rally where they achieved a rare 1-2 team finish. "We are looking forward to yet another great outing with my teammate Manvir. Kajiado will be a very important rally for me though as second overall position will guarantee me the coveted title. 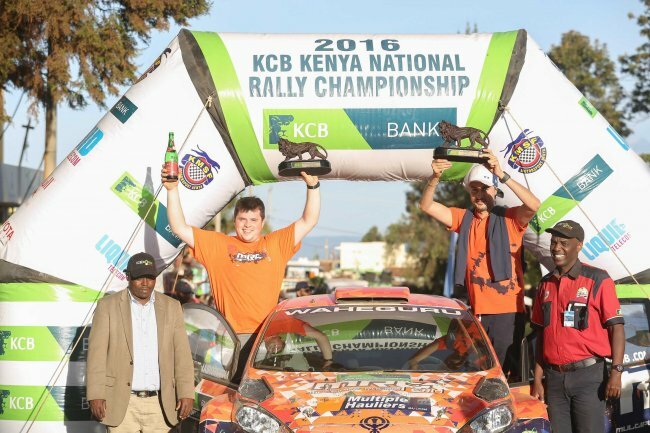 Last year we were pretty fast but skipping Kajiado and retiring on Safari while leading by a massive margin ended our title aspirations," said Laukannen. Laukannen who is racing on a Kenyan competition licence has literally swept the ground with all his opponents since joining the KNRC in 2012. The winner of the last three rallies is 21 points away from a maiden KNRC diadem. He leads the KNRC series with 129 points against Jaspreet Chatthe's 100. If the Flying Finn wins the penultimate Kitengela Rally, he will savour his maiden title on Kenyan soil. Should Chatthe win Kitengela Rally and Laukannen settles for second, the Finn will have racked up an unassailable 150 points to Chathhe’s 125, meaning the season closing Guru Nanak Rally will be a mere formality. Other top drivers expected to spice up the occasion include Onkar Rai, Rajbir Rai, Baldev Chager, Carl "Flash" Tundo and Ian Duncan who is also the KNRC Group N leader. Duncan and his co-driver Amaar Slatch will drive a Mitsubishi Lancer Evolution X under the Liquid Telecom Racing banner. Sammy Nyorri, Alex Lairangi, Champion Leonardo Varese and leader Eric Bengi are the main suspects in the Two Wheel drive class. Bengi leads the Two Wheel log on 131 ahead of Lairangi who is a point adrift. Baryan and Rajbir Rai will run the crowd- pleasing Ford Fiesta R5 cars which are yet to win an event in Kenya. There is also a non homologated Ford Fiesta Proto for Tundo also going for its maiden win on Kenyan soil. Tundo's Proto will score points towards the main KNRC class and the Specially Prepared Vehicle (SPV) category. Division 1 driver Asad Khan "Kalulu" will also score SPV points in his Subaru contraption. Tundo finished fourth in Eldoret and hopes to go for nothing shot of a podium in Kitengela Rally. There’s a fabulous fight in prospect in the KNRC Division 2 category which has attracted KNRC regulars with a mix of cars that include the Subaru Impreza N12 of leader Mahesh Halai and Toyota RunX of second placed Bengi. Group S has the series leader Chandrakhant Devji "Chandu" pushing for more championship in his Subaru GC8. The rally, which was initially programmed for Nakuru, gets underway from KCB Kitengela Branch on November 6. The event organised by Equator Motor Club (EMC) will feature three stages which will be repeated twice for a competitive total of 140km and a liaison distance of 134km. The designated Spectator Stage will be situated at the start of the 44km CS3 stage near Kajiado airstrip. The Service Park will be centred at Kajiado field next to Total filling Station. The ceremonial finish and prize giving will be held at the Spectator Stage (2km from service) from 5:00pm onwards. Main class: 1. Tapio Laukkanen 129, 2. Jaspreet Chatthe 100, 3. Rajbir Rai 79, 4. Ian Duncan 72, 5. Carl Tundo 66. Division one: 1. Onkar Rai 117, 2. Asad Khan 66, 3.Jasmeet Chana 61. Division two: 1. Mahesh Halai 128, 2. Eric Bengi 106, 3. Adil Mirza 45. Division three: 1. Natasha Tundo 125, 2. Osman Abdullahi 87, 3. Chandrakant Devji 78. Group N: 1. Ian Duncan 113, 2. Mahesh Halai 65, 3. Jasmeet Chana 51. Group S: 1. Chandrakant Devji 78, 2. Edward Maina 74, 3. Jasmeet Chana 25, 4. Kimaru Boit. SPV: 1. Asad Khan 105, 2. Adil Mirza 57, 3. Carl Tundo 50. Classic: 1. Jonathan Somen 25, 2. Ramesh Vishram 21, 3. Dinesh Sachania 18. 2WD: 1. Eric Bengi 121, 2. Alex Lairang'i 120, 3. Leonardo Varese 86, 4. Sammy Nyorri 78, 5. Gurmit Thethy 15.